A number of people, often much younger than I, who are of a conservative or libertarian persuasion, often criticize or question my policy views. Unlike these younger people, however, I remember the stories of the Great Depression my parents and grandparents told me. Those stories changed my life and views forever, as did the many stories of a caring, compassionate Jesus of whom I learned as a small child. My father quit school at 16 to ride the rails to find a job, as did many thousands of young teens of his generation. At 17, he convinced his mother to lie about his age so he could join the Army for a steady paycheck. My mother lived in a cousin’s barn after her family lost their home and business. My grandfather walked the hundreds of miles of highways and byways of western Washington state selling spices door to door to support his family. Because there was no social security that enabled older people to live on their own, my grandfather’s mother lived with my mother’s family so that she wasn’t forgotten and abandoned to an “old folks” home as so many were before and during the Great Depression. When I hear the plans and policies of the modern GOP that so much emulate those prior to and including the Great Depression, I can’t help but remember the stories my parents passed down to me of the Great Depression and before. Our society is far from perfect, but it is so much better than what existed near the turn of the 20th Century for ordinary working families. For all the libertarian talk…. I’ve stayed silent out of disgust and depression following the defeat of the SAFE Banking Act, proposed by Senators Kaufmann (D-DE) and Brown (D-OH). This one act would have broken up the 6 mega-banks that still threaten our economy and the world. Our only hope is that the EU will override Geithner and Congress by breaking up the banks in their countries. The U.S. may be forced to follow. Geithner’s not wanting to upset the markets is the wrong policy to take…and it’s really pitiful that he doesn’t see it and is poorly advising the President. But that’s not what I propose to write about today. As I sit here writing, I’m watching another episode of PBS’ American Experience on the 1930s. 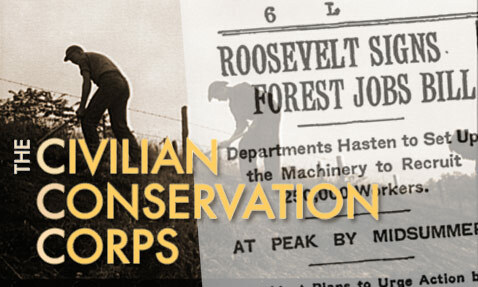 This week the series focuses on the Civilian Conservation Corp.
Before the Corp was enacted and millions of young American men were put to work, against all the hue and cry denouncing it, the country had split nearly in two. One portion of the populace believed that those out of work and suffering home loss, denied food and shelter, were strictly on their own. Charity and families only should help these millions of families. Another portion of the populace looked to government for help, realizing that only government had the resources to help. Between these two political camps lay a populace that believed the Republic had failed, that’s it’s philosophy no longer worked and democracy had been taken over by plutarchs. For these people, they saw communism as the new path to follow. The propaganda coming out of the USSR led these down and out, discouraged people to think that communism was better than our democratic republic. 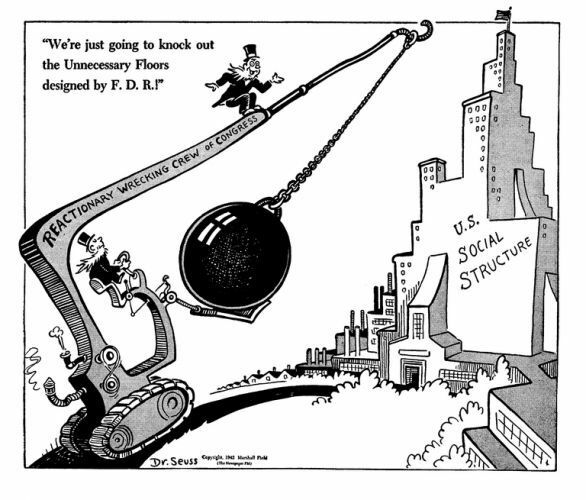 FDR seemed to understand the danger to the Republic if conditions remained. In setting up the CCC, regardless of his being called another Hitler, or Mussolini or socialist, he went ahead with the program. He put men to work who without that work may really have revolted. The men interviewed in this American Experience program thanked FDR and loved the CCC. It gave them hope and so much more. It saved their lives and taught them to believe in our country again. So when I hear libertarian talk or the rhetoric of conservatives, I remember the struggles of so many families during the 1930s. My own family – both parents – included. My dad road the rails after leaving home at 16, like so many other young men and women. The Army/Air Corps saved him. Mom’s family lost their home and income, turning to a relative for shared housing while my grandfather hiked the roads of Washington State as a commission only door-to-door salesman. The only work this talented butcher could get. I remember what it was like for those millions of families who had nothing or had lost everything. Compassion is something that has to be learned and well taught. I think we, as a nation, have forgotten compassion. Maybe the American Experience series should become mandatory viewing in every family and household. We might learn a little from our forebears. The market crash of 1929 and the Great Depression were brought on by the very same behaviors that caused the Great Recession and financial crisis. Overconfidence in the belief that prices would never fall. Over-speculation. Debt levels too high. Leverage too great. While the financial instruments that sparked this crisis did not exist, the euphoria brought on by rising profits and wealth caused everyone to “get in on the action.” Greed overcame prudence…and thoughts of risk were pushed aside as everyone told themselves the market will never fall. Well, the market did crash in 1929 just as it did again in 2008. Jesse’s Café Américain, an economy blog, wondered if the monetary expansion seen today as a response to the Great Recession had an historical equivalent in the Great Depression. He found it and offers, as well, his recommendations on changing the current economy. It follows closely what many other well respected economists are saying…and could help Congress in its financial regulatory deliberations if they were willing to take the advise of someone outside of the Beltway and Wall St.
Let’s take a look again at a prior period of dollar devaluation and monetary expansion in a period of deep recession, the period in the 1930’s in which the US departed from specie currency to facilitate the radical expansion of the monetary base. As you can see, the Federal Reserve increased the monetary base in several steps, resulting in an aggregate increase of about 155% in four years. 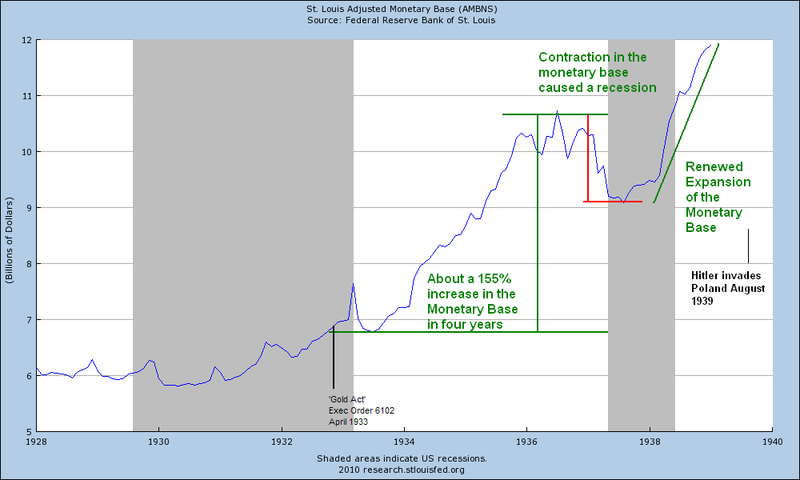 In this chart above one can also nicely see the contraction in the monetary base, the tightening, that caused a dip again into recession in 1937. It is also good to note that the recession ended and the economy was in recovery prior to the start of WW II, which I would tend to mark from Hitler’s invasion of Poland in August, 1939. There was a military buildup in Britain before then, but I believe that the common assumption that only the World War could have ended the Great Depression was mistaken. The status quo has failed in its own imbalances and artificial distortions. But while avoiding bubbles in the first place through fiscal responsibility and restraint is certainly the right thing to do, plunging a country which is in the aftermath of a bubble collapse into a hard regime, such as the liquidationists might prescribe, is somewhat like taking a patient which has just had a heart attack and throwing them on a rigorous treadmill regimen. After all, running is good for them and if they had run in the first place they might not have had a heart attack, so let’s have them run off that heart disease right now. Seems like common sense, but common sense does not apply to dogmatically inclined schools of thought. What the US needs to do now is reform its financial system and balance its economy, which means shrinking the financial sector significantly as compared to its real productive economy. This is going to be difficult to do because it will require rebuilding the industrial base and repairing infrastructure, and increasing the median wage. The US needs to relinquish the greater part of its 720 military bases overseas, which are a tremendous cash drain. It needs to turn its vision inward, to its own people, who have been sorely neglected. This is not a call to isolationism, but rather the need to rethink and reorder ones priorities after a serious setback. Continuing on as before, which is what the US has been trying to so since the tech bubble crash, obviously is not working. The oligarchies and corporate trusts must be broken down to restore competition in a number of areas from production to finance to the media, and some more even measure of wealth distribution to provide a sustainable equilibrium. A nation cannot endure, half slave and half free. And it surely cannot endure with two percent of the people monopolizing fifty percent of the capital. I am not saying it is good or bad. What I am saying is that historically it leads to abuse, repression, stagnation, reaction, revolution, renewal or collapse. All very painful and disruptive to progress. Societies are complex and interdependent, seeking their own balance in an ebb and flow of centralization and decentralization of power, the rise and fall of the individual. Some societies rise to great heights, and suffer great falls, never to return. Where is the glory that was Greece, the grandeur that was Rome?